Malaysia – Terima Kasih !! “Terima Kasih” means “Thank you” in Malay language. iShares has the EWM ETF for Malaysia. It has assets of just over $1B and is up over 30% YTD this year – a fantastic performance when compared to the US markets. Not many stocks of Malaysian firms trade in the US.However Malaysia is a stable, high growth developing country. More detailed research on Malaysia will be posted here in a week or two. 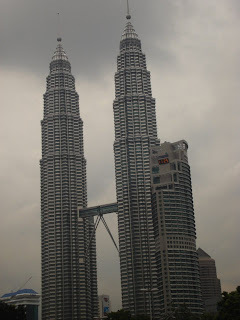 Photo: Petronas Twin Towers in Kuala Lumpur (KL), Malaysia.